Classic buttermilk biscuits have been a staple in my household for as long as I can remember. They are easy to prepare and can be served for breakfast, lunch, dinner or even dessert. 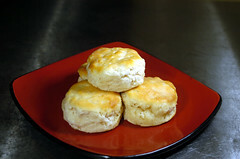 At Hardee’s they serve up a wonderful buttermilk biscuit and with today’s secret recipe you can make them at home. Mix together, but do not knead. Roll out to 1″ thick. Cut and brush tops with additional buttermilk. These biscuits are easy to prepare and are a great addition to any dinner. Combine flour, sugar, milk and mayo into a smooth dough. Divide batter equally between 10 paper-lined muffin tins. Bake at 350 degrees F for about 25 to 30 minutes or until golden brown and doubled in size. Spread the pie filling into a square baking pan. Put the slices of butter on top of the pie filling, placing them as evenly as possible. Carefully remove the pie crust from the pan it is in, and place it carefully on top of the pie filling and butter. You will need to cut off the edges that hang over and make them fit on the square pan. Sprinkle liberally with cinnamon and sugar. Bake for about 20 to 25 minutes, until pie crust is lightly browned. When I lived in Florida we had a Hardee’s near by. I would go there from time to time for a burger and fries, but I was surprised to find this recipes for a sweet treat ! Enjoy! MIXTURE- Empty the box of cereal into blender. Add in cinnamon and brown sugar and pulse on high speed, for about 3 seconds or until crumbled, but not powdered. Empty into small bowl. Stir in melted butter with a fork. Set aside. BISCUIT DOUGH- Using a 2-qt mixing bowl. Stir Bisquick together with sugar and raisins. Put buttermilk, Tonic water and vanilla into a measuring cup, and pour into Bisquick mixture. Use a fork to mix until all of the liquid is absorbed. Then knead in the bowl with hands, dipping into additional Bisquick, to make dough smooth and no longer stick. Break dough up into 5 portions in the bowl – sprinkle the “Flake” mixture over the dough and then work it in until most of it is evenly distributed throughout the dough. Divide dough into 12 equal parts and shape each into 1/2″ thick patty, arranging close together in Pam-sprayed 12″ round or oven-proof skillet (or use 2 8″ round layer cake pans). Bake at 400F for 25 minutes or until golden brown. Remove pan to wire rack and wipe tops with icing. ICING- In small bowl with electric mixer on high speed, beat 2 tbs melted butter, 1 tsp vanilla, 2 tbs sour cream, dash of salt and 1-1/2 c powdered sugar until smooth. Place a rounded tbs of icing atop each biscuit right out of the oven. The heat of the biscuit will soften the icing just enough that you can swirl it around to coat the tops nicely, letting the icing stand on the warm biscuits half a minute before spreading it. Refrigerate any leftover icing in covered container to use within 2 weeks.